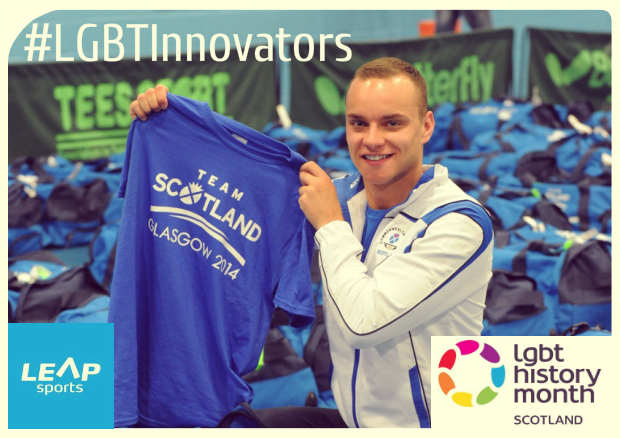 #LGBTInnovators - Scottish Former Swimmer & LEAP Sports Patron Martin Cremin | LEAP Sports Scotland LEAP Sports Scotland Patron. "> LEAP Sports Scotland Patron. Martin Cremin is a Scottish Former Swimmer and LEAP Sports Scotland Patron. Martin is from Dunblane and learned to swim at Wallace High School Swimming pool in Stirling. He has competed in the 400m, 800m, 1500m freestyle and 5 & 10K open water events. Amongst his many impressive achievements, Martin was a Scottish Champion in 1500m Freestyle, was British Universities champion in 1500m Freestyle, & 400m & 1500m (Short Course) champion. Martin has also represented Team GB and Team Scotland at many events and cup tournaments around the world. Martin ran with the torch relay in both the 2012 Olympic Games and the 2014 Commonwealth Games, at which he also competed as part of Team Scotland. Martin now serves as a full time police officer, having initially joined the police force as a special constable for Forth Valley division in March 2013 and now as a Police Constable in the Metropolitan Police Service. In an interview with Kaleidoscot in 2014, Martin said “I really wanted to talk out to end any perception that as a gay person you can’t participate in sport…It’s a very supportive, inclusive community, and for me being gay and a swimmer has never been an issue.” On being a role model, Martin says “I just hope someone might feel easier about taking part in sport after seeing that I’ve had a really good experience – that would be great”. On becoming a Patron in October 2015, Martin said “LEAP Sports Scotland has achieved a great deal in the short time that it has been operating. Pride House is one of my stand out memories from Glasgow 2014. I feel privileged to be joining the organisation at what is an exciting time for LGBTI sport in Scotland and I hope that I can use my role to help LEAP achieve its goals in the coming months”. Written on 14th February 2016.